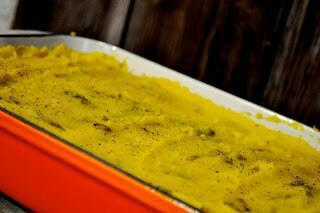 This is truly a unique take on Shepherd’s Pie, mashed squash and potatoes topping a spicy curry meat layer below. Can you say happy curry tummy? I can! I actually found this recipe over a year, forgot about it and remembered it at least twice before finally making it tonight. The original recipe came from a twitter friend and fellow blogger Marissa. 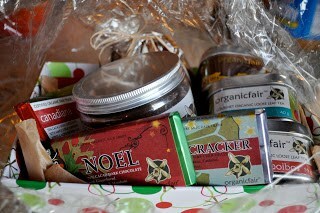 Marissa is the owner and creative force behind Organic Fair out of Canada and I had the pleasure of trying some of their products after winning a gift basket over the Christmas holiday. The basket came last week and oh my I have a new favorite chocolate bar, The Canadiana. Smoked salt, and maple syrup made the bar truly stand out for me. But we’re here to talk about Shepherd’s pie, right? I love Shepherd’s pie, so much in fact I like to make it for my parents for Christmas. This version is on my keepers list and I think EVERYONE should try it once, it’s great. Don’t let the spices fool you, while it is full of flavor it’s not overly hot or spicy. Enjoy, we did. Someday when I have ALL the ingredients I will make Marissa’s version until then I shall enjoy this humble edition. Awesome idea! I love Shepard's Pie but have never thought to play around with it. Oh Laura ! You are always so lovely. Squash is much more local/sustainable than yams anyways -great sub 🙂 I wish I could send you some of our ice cream …actually this is the only time of year that I probably could! One day you and your wildebeests will just have to come visit the farm or I'll just see you in my favorite(apparently yours too) city, San Francisco for some blogger thing 😉 I'm happy you're enjoying the treats – you deserve them ! I know who to send future salted chocolate bars to for product testing 🙂 PS Try the Mythic Mole on popcorn-so good ! Oh my, shepard's pie is one of our favorites! Combine that with one of my favorite things–curry–and I think we may have a super winner in my house! Happy Curry Tummy! Love anything with curry in it. You ARE talking directly to me. Love the idea of a shepherd's pie and love curry recipes. So this one is a win win for me. Thanks!